L&L Holdings has taken a major step towards erecting the first new office tower along Park Avenue in more than 30 years. The Wall Street Journal reported the firm has reached out to 11 big-name architects, including three Pritzker Prize winners, for design ideas on a new skyscraper at 425 Park Avenue, between 55th and 56th Streets. L&L Holdings acquired the long-term lease on the existing building in a partnership with Lehman Brothers Holdings in 2006. In an effort to boost revenue on the prime Park Avenue site, it wants to demolish the existing 31-story, 567,000-square-foot, circa-1950s office tower and replace it with a new $750 million building. The property is currently mostly leased with rents of about $50 to $70 per square foot. The Journal speculated that a new building would attract rents of more than $100 per foot. To build as tall as possible per building codes, L&L Holdings must keep 25 percent of the existing structure, although Bloomberg is working to change those rules. In the meantime, L&L hopes to have the building vacant by 2015 so that demolition can start and the building can be complete by 2017. Wow. I wonder how tall this could be. If they did a residential, rather than office, they could probably build over 1,000 feet. ...Mr. Levinson said he had asked each of the competing architects to prepare designs for towers that could be built under the current regimen and with a higher density. it in a conceptual design prepared for the developer David W. Levinson. Norman Foster of Foster & Partners, the architect of Hearst Tower and of the planned 2 World Trade Center, has been chosen to redesign 425 Park Avenue, a nondescript 55-year-old white brick office tower on a prime site, between 55th and 56th Streets. The preliminary conceptual design by Mr. Foster has few of the structural pyrotechnics evident in his other New York projects: the diagonal grid and crimped corners of Hearst Tower or the diamond-shaped pinnacles of 2 World Trade Center. It was chosen instead for its provision of common areas throughout the building where occupants can gather informally. “The whole idea of office space is to have places where you can have an intersection of ideas, areas of collaboration,” said David W. Levinson, the chairman and chief executive of L&L Holding Company, which expects to control the site in 2015, when the reconstruction would begin. One of the common areas planned for the future 425 Park Avenue building. Mr. Foster was picked from an invited field of four internationally renowned architects — starchitects — who competed for the 425 Park Avenue commission. The others were Zaha Hadid of Zaha Hadid Architects, Rem Koolhaas of OMA, and Richard Rogers of Rogers Stirk Harbour & Partners. “We spent many hours with each of the firms talking about the concepts over a period of many months,” Mr. Levinson said. As each of the four proposals evolved, he said, it grew tougher and tougher to make a final call. Among the criteria applied to the winning choice, he said, were the prospective costs of the building and the architects’ familiarity with working in New York City. The public will have a chance to second-guess Mr. Levinson’s choice on Oct. 19 at the Municipal Art Society’s Summit for New York City, when all four proposals will be on view. Last edited by Merry; October 4th, 2012 at 05:31 AM. Foster clenches competition for new Midtown tower. Foster + Partners have won an invited competition for a new office building on Park Avenue for L&L Holdings and Leman Brothers Holdings. Lord Foster’s firm bested entries by finalists OMA, Zaha Hadid Architects, and Rogers, Sirk, Harbour + Partners. The 625,000-square-foot tower will neighbor icons like the Seagram Building and Lever House. “Our aim is to create an exceptional building, both of its time and timeless, as well as being respectful of this context—a tower that is for the city and for the people that will work in it, setting a new standard for office design and providing an enduring landmark that befits its world-famous location,” Norman Foster said in a statement. The three-tiered tower’s architectural vocabulary is a contemporary take on midcentury precedents. Each tier will have its own landscaped terrace, and the tower is designed with large, flexible floor plates. The building will be LEED certified. “We are looking forward to beginning a process in which we translate Foster’s brilliant concept into a modern tower which offers its inhabitants the most functional and environmentally sustainable work environment imaginable while also addressing the public realm in a way that hasn’t been accomplished in many years,” said David Levinson, L&L Holdings Chairman, in a statement. L&L and Leman Holdings previously invited 11 internationally renowned firms before narrowing the list to the four finalists. Vishaan Chakrabarti, director of Columbia’s Center for Real Estate and a partner at SHoP Architects, led the competition process. Foster will present his design at the Municipal Art Society’s Summit for New York City on October 18. An exhibition of all of the finalist’s designs will be on display at Jazz at Lincoln Center’s Rose Hall, where the two-day summit will be held. 425 Park Avenue in 1957, showing Mies van der Rohe's Seagram Building under construction in the background. Hopefully, the crown is nice. That will make a huge difference in an otherwise banal tower. Moved thread to NY Skyscrapers forum. “Our aim is to create an exceptional building, both of its time and timeless, as well as being respectful of this context—a tower that is for the city and for the people that will work in it, setting a new standard for office design and providing an enduring landmark that befits its world-famous location,” Norman Foster said in a statement. This stretch of Park Ave has been International in style for a long time, some of it good, and some of it awful. It identifies with an era exemplified in many films of the late 50s and 60s - what it was like to work in an office in Midtown Manhattan. I wonder if L&L is actually going to raze everything above the base, or, instead, keep the bulk of the existing structure and simply modify it and add a bit on top. It seems to have the same basic shape, including the blank walls on the eastern facade. This is ok, but it's certainly not a "landmark". Those exposed exterior buttresses stretching over the common areas remind me of the Hearst Building's interior. The elevator/stairwell hump sticking out of the east side of the structure looks crappy. All in all, not bad. This is right across the street from me. I'll enjoy watching it get built. I agree with your assessment of "not bad," but one of the most prime locations in our flea bag city deserves a landmark. While I like the clean lines and setbacks, I can't help feeling a little deflated about this design. I really hope it gets delayed until the upzoning kicks in so we can have a tower worthy of this site's potential. I'm still trying to figure out how this will work. Surely, the current foundations cannot withstand an addition at least 2x its existing height and bulk. Will they have to drive new piles alongside the old ones? Will they reinforce existing foundations? The whole concept just seems very tricky to execute - demolishing 1/2 of a skyscraper and then adding 4x the height to the stump that's left. In all the media I've read, it is stated that the building will be demolished. As the plan currently stands, Foster + Partners has proposed to raze the current structure and create a LEED-certified 650,000-square-foot tower featuring a tapered steel frame rising to meet three illuminated shear walls. The conceptual design also calls for a façade that allows for three gradated tiers of column-free floors. 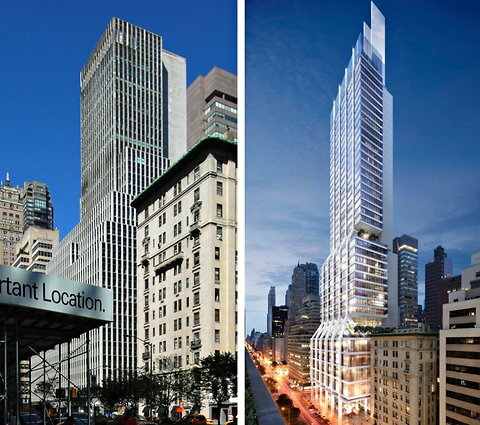 The new building will replace the current 559,763-square-foot tower spanning 55th and 56th Streets. The office building currently at the site will be demolished. Construction won’t begin until 2015, when the building’s original land lease and office leases will expire.